In October 2011, Brainshark lunged at the chance to offer a better viewing experience for PowerPoint presentations on iOS devices, and this week the company is declaring its SlideShark app a success. However, Microsoft is now swimming in this direction as well, so it remains to be seen whether the app will be able to co-exist with the great white shark from Redmond. SlideShark is designed for people who want to use their iPad, iPhone and iPod Touch to view and show PowerPoint presentations while maintaining the original formatting and rendering of advanced elements, like special fonts, graphics, animations and videos. Brainshark said on Tuesday that about 5 million presentations with a total of about 150 million slides have been uploaded to SlideShark in the past two years in more than 150 countries, mostly by professionals in sales, marketing, education and other fields. An average of 8,700 presentations are uploaded every day to SlideShark, which has both free and fee-based versions and which has been downloaded about 2 million times. It currently has an average rating of 4.5 stars on the Apple App Store. This demand, according to BrainShark, proves that there is a real need for the functionality provided by SlideShark. "This product is a presenter's best friend when they need to show a PowerPoint using an iOS device," said Andy Zimmerman, Brainshark's chief marketing officer. Microsoft hasn't yet released a native Office edition for the iPad, although company officials, including CEO Steve Ballmer, have said it's in the works. The company has an iPhone edition of Office that's available only to subscribers of its Office 365 cloud collaboration suite. Microsoft has also put a lot of effort lately behind improving the browser-based version of Office, called Office Web Apps, with a particular emphasis on the user experience for via Safari on iPads. So, will there still be a need for SlideShark once Microsoft comes out with Office for the iPad? Brainshark is confident there's a future for SlideShark, which lets users store presentations both locally on the iOS devices, on its cloud and on third-party cloud storage services like Box, Dropbox and Google Drive. "SlideShark isn't a PowerPoint alternative. It's complementary to PowerPoint," Zimmerman said, adding that SlideShark will offer users enough differentiation to justify its continued use after the arrival of a native iPad app for PowerPoint. He points out that SlideShark also provides usage analytics data, so sales and marketing professionals can track the popularity of presentations they share with colleagues and with existing and prospective clients and partners. 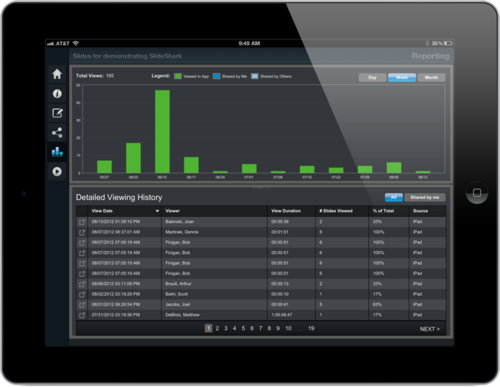 SlideShark offers other features as well, like the ability to broadcast a presentation via the web for remote users. In addition to the basic free app, Brainshark also offers a more sophisticated Pro Edition of SlideShark, as well as a Team Edition for workgroup collaboration on presentations. The company is considering creating a version of SlideShark for Android as well. Ted Schadler, a Forrester Research analyst, said there are other apps and cloud services that compete with SlideShark to varying degrees, but that there will continue to be space for companies like Brainshark, given the gap they're filling, in particular in sales situations. "Even if Microsoft does support PowerPoint on iPad and Android, it won't necessarily have the workflow around presentation distribution, analytics, etc., that turn the document into a sales resource. So there's still plenty of market opportunity for a company like Brainshark," he said via email. "Documents are the shipping containers of information processes: they carry the payload. But the processes themselves are incredibly varied by industry, function, and scenario," Schadler said. So while Microsoft has the core platform for those documents -- PowerPoint in this particular instance -- many vendors provide complementary functions for workflow, transmission, security and collaboration, he said. For Brainshark, the app has also become a customer conduit for its other products, including its flagship Brainshark On Demand, an enterprise app for creating, showing, sharing, tracking and managing video presentations, primarily for sales and education scenarios. From a product development perspective, the company would like to more tightly integrate SlideShark with Brainshark On Demand and its other products, according to Brainshark's vice president of product management David Kline.